Primitive fishing at its finest! 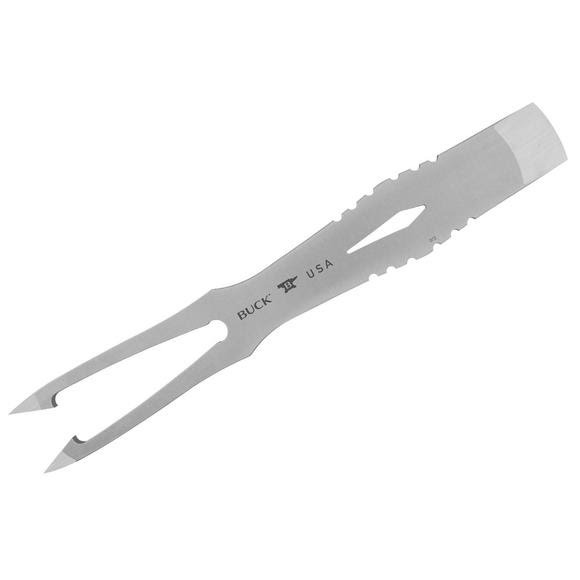 The Kinetic Gig Spear from Buck Knives features two point barbs designed for downard puncturing movements on a fish or frog. The barbs were designed to hold tightly to prey. The Gig Spear can be mounted to a spear pole (not included) easily by utilizing the chisel point and 550 cord (included). Primitive fishing at its finest! The Kinetic Gig Spear from Buck Knives features two point barbs designed for downard puncturing movements on a fish or frog. The barbs were designed to hold tightly to prey. The Gig Spear can be mounted to a spear pole (not included) easily by utilizing the chisel point and 550 cord (included). With an overall length of 9 1/2&apos;, the Kinetic Gig Spear is the perfect size for your primitive fishing experience. Heavy-duty polypropylene sheath included. For more primitive hunting options, see our other products in the Kinetic Spear Series lineup. Please follow all safety instructions.